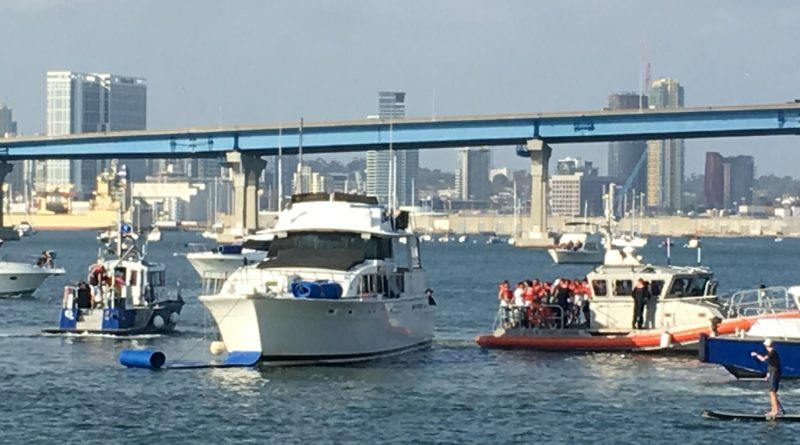 SAN DIEGO — The U.S. Coast Guard and Port of San Diego’s Harbor Police are seen here boarding a party boat once at the center of a drowning incident in 2011. Dozens of people aboard the charter, which is known as Champagne, were escorted off the vessel and taken back to shore aboard a Coast Guard boat. Champagne is an alleged illegal charter; its boarding was part of a coordinated effort by multiple agencies – such as the Coast Guard and Port of San Diego – to crack down on illegal charter operations in California’s southernmost bay. No information was provided as to what code violations were committed aboard the charter, which occurred during Labor Day weekend. An unnamed source forwarded this photograph of the charter being boarded by Coast Guard and Harbor Police officials. The unnamed sourced told The Log of Champagne being boarded on multiple occasions. Sgt. Victor Banuelos of the Port of San Diego’s Harbor Police stated the boarding was part of a joint enforcement operation. The Labor Day weekend boarding pales in comparison to a reported incident aboard Champagne seven years ago. A 23-year-old man reportedly jumped off Champagne and into San Diego Bay in 2011. He ultimately drowned and died, with divers pulling his dead body from the bay. His death was ruled accidental, according to a news report. “Harbor Police confirmed they’ve had several contacts with the boat, but said there isn’t a paper trail because most of those contacts were nuisance calls,” a 2011 Fox 10 news report about the drowning death stated.